Some of you know I spent the weekend with my dear friend KJ and her partner JB. It was a magical time of good food, nature walks, taking pictures and making art. The three of us sat silently making collages, occasionally peeking to see what the others were doing and exclaiming with an ooh or aah as we watched the progress. This is mine. I know what it says to me but I'd love to hear what it says to you. Look at each element. What do they symbolize? How does this image make you feel? And if you haven't already see it, here is KJ's amazing collage. Her very first one! I'll see if we can get her to show JB's as well. Sounds like a wonderful weekend. Nothing better than time spent with friends. Love the collage, nice balance and great combinations. Beautiful !! What I think of when I see this is the process of knowledge and aging, and ultimately the spirit flying away. It is a good feeling, not something morose but mor about the utilization of the time we have to learn, to pass that on, and then us passing. Lo, sounds like you, KJ, JB AND Stella had a fabulous weekend! This a LIFE collage....the two girls are full of youth, dreams, plans...the elder - a life realised, goals met (or not), but wise and full of peace. The rocking chair - home, hearth, calm...the Butterfly - release, freedom to move to the next world, fly high, seeking stars and eternity. Both you and KJ did stellar work....hope you both can persuade JB to reveal her collage too. I'm glad people are seeing what I saw after I made it. I'll reveal my interpretation sometime later. What this says to me? The older woman is our mother. The two young girls represent what I've always wanted with my sister but have never had. Sorry to be so bleak, Laurel. I see the aging grandma not sitting in her rocking chair but out in the world mentoring these two young girls. i really love what you all have to say! I usually don't comment/respond on my own blog but this calls for it. And it's fun. It was hard not to read the other's first-but I didn't peek. I keep thinking of the concept of the all knowing infant...that all knowledge is within us, and we are probably closer to that as children because life strips away what we know from within and replaces it with a lot of other crap. Dealing with various aches and pains the rocking chair is quite ominous to me-the butterfly mitigates that. Leave the body and be free? If that were really the case, we'd all just dive off cliffs like lemmings! Wouldn't it be funny and ironic if we lived to be 100's of years old, died and found out there was a big party going on in the afterworld that we'd been missing all this time? i can never spell adroygne correctly. but you know what i mean. she looks like that, wise in her masculine/feminine age and bearing. what intrigues me most is the rocking chair. it glows. i think it offers wisdom to the young and old of us. i think that wisdom is about gently swaying to and fro. i love that you've put this up for interpretation. i love your blog. and lo, girl, i love you. 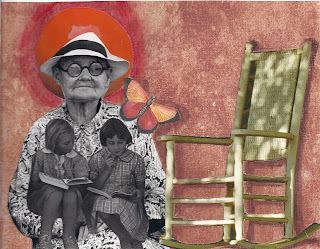 i see the eternal mother in the grandmother, and the passing on of her wisdom to her gradndchildren, the circle of life... and the rocking chair signifying that we all get to it in the end, rocking rocking waiting for our end... a wonderful image and i am sure a wonderful weekend. This just tell me that the young learn so much from their elders...knowledge is flowing out in the form of the butterfly...reaching goals and new heights with information (and love and support). I really like this collage card. It has a positive message (to me), and makes me think of my father, who is deceased...but his whole life was devoted to education of himself and others!!! I've so missed checking everyone's blog! You've got some great posts this past week. I love the animals cuddling (or not) and your Earth Day post. Here I'm thinking sisters comfortable in the love of a grandparent, spending lazy days visiting them in the summer and the memories of the porch which runs the length of the house was beautiful....I put more into it than you portrayed, but that's what it made me think of. It looks to me like BFFs were gathered together and they talked about everything. (two girls reading big books) Reminiscing about people of the past during some of the conversaiton (old person in background) Having the best of time, excitin (sun)yet a most relaxing time (rocker). It makes me feel good. Wish I could have been there. KJ...how could I have overlooked your comment? Jeepers! I'm looking forward to more art days at either place. It was just what the doctor ordered. The whole weekend was! Has the butterfly grown on you? I love the friendship we've formed and the fact that we bought it into the flesh, into 2 dimensions. There are so many dear bloggers I'd love to do that with! That said, I love you too KJ. Before I read anyone else's this is mine...Gramma sitting in her rocker reading to her grands. Lovely image. The older woman is holding the cherished aspects of her younger life (the two girls )close to her heart...The empty rocking chair to me signals someone is missing...someone who shared a kindred spirit...a kind of "front porch friend" one could spend hours in silence with just breathing the same air and still end up feeling a great intimate experience was shared. The older woman is alone now...except for her vivid memories. The butterfly is her touchstone to them...an element of hope. Whew! Well,the first thing comes to me seeng this great piece is LOVE!This collage is full of Love!